Custom pull out sliding shelving to make your life easier - made in the USA! We have been manufacturing and installing pull-out shelving for over 28 years! Installing a custom pull-out sliding shelf can be an easy do-it-yourself home improvement project that can really can improve the quality of your life. Install the best quality kitchen rollout slide out shelf from the best and the original pullout shelf company. Shelves that Slide where we say "We make your life easier" and our sliding shelves really do! 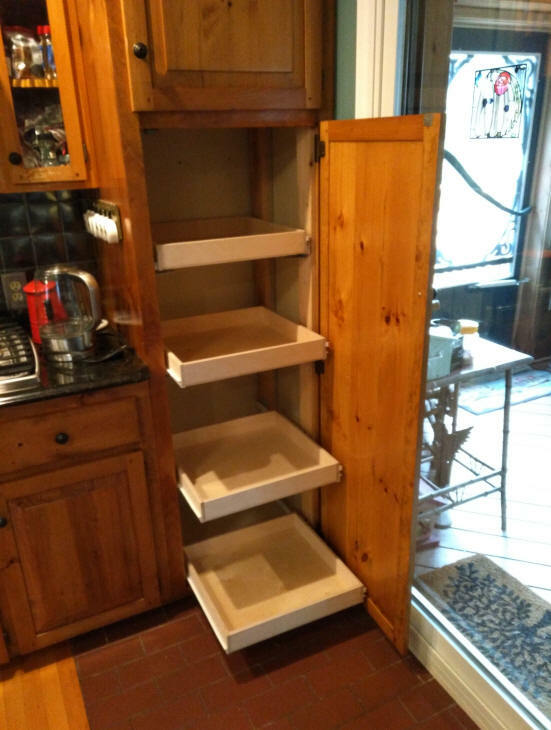 custom pullouts for cabinet opening widths from 5" to 39" and depths from 9 3/4" to 35 3/4"
Shelves that Slide has been custom making pullout kitchen shelving for a nearly 30 years now. We call them sliding shelving but they are really more short sided drawers. Some have taller sides, fronts and backs or we even have shelves with slanted sides and a tall back. We make bread drawers with sliding tops to keep your breads and rolls safe and fresh. 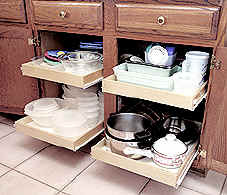 Our custom sliding-shelves installed in your kitchen cabinets make your life easier every day you use them. To make our pull out shelves we use top quality materials such as grade B/B 9 ply Baltic Birch for our kitchen shelving and drawer slides from Blum to build some of the best sliding shelves money can buy. We did not invent pull out shelves, they have been around for over fifty years and probably longer than that. Take a look under the sink in most houses and you will find that the cleaning supplies are usually kept in a box of some form or another. 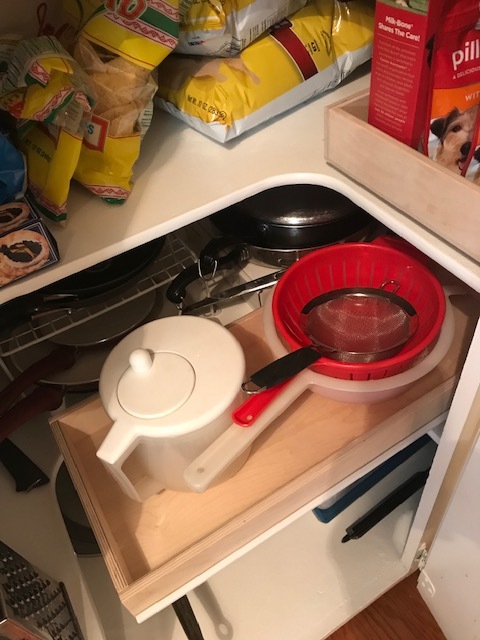 It is difficult to get items out from a sink cabinet and by necessity people tend to put all of the cleaning supplies in a box and then slide it out to grab what they need. Of course in this case there are no slides an you have to support the box as you pull it out but really it is not a far cry from there to a wooden box or drawer with slides attached. Yes it is a major improvement but not really that big on an advancement. When Del Web started the Sun City idea so many years ago the home design was made with seniors in mind. We learned this the hard way. We had sold shelves in Green Valley which is a retirement community south of Tucson and then we started selling them in Palm Springs. We decided that the Sun City area in Phoenix would be a great market for our shelves and began advertising in the Arizona Republic newspaper. We did zoned ads in the original Sun City area. We were a very small business and it was a big deal to us to spend the money we were spending and we were excited at the calls we expected to receive. After all when we kicked off in Green Valley the response was immediate which is why we were puzzled as to why we received no calls from Sun City even after several ads had run. We finally decided we needed to take the 2 hour drive from Tucson and see what was going on. We stopped at the first open house that we found in Sun City. We could have tried some fast talking and told the realtor that we were looking at homes for our mother but we were honest (I know that can be rare but we really were and still are an honest business) and told her that all we wanted to do was to take a look at the kitchen. Boy were we surprised and I guess somewhat relieved when we saw that Del Web built the original Sun City homes with deep drawer storage and that the only regular cabinet in the kitchen was the one under the sink and guess what, people were already using plastic boxes or even cardboard ones and there was just no real need for us in those homes. Fortunately for us when the newer parts of Sun City were built the cabinets installed were the traditional style and all we had to do was change the zone we advertised in and the phone started ringing. It was a great lesson for us and probably the best 2 hour drive we could have made. When we started this Shelves that Slide website we were looking to provide a place where our local customers could turn to find out more information about our pull out shelves and kitchen accessories. Advertising is expensive so our ad in the Arizona Republic Newspaper was small and having the website allowed our local customers to see more information than we could put in that small ad. 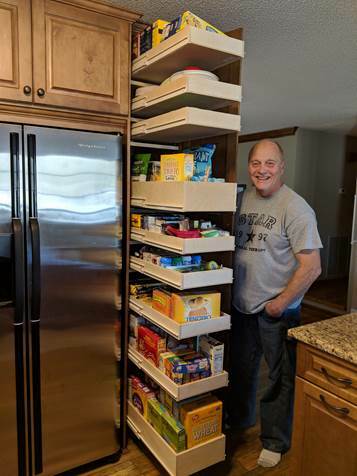 Our slide out shelves are great for kitchen, pantry and bathroom cabinets and they are great for home office and entertainment centers but how do we let people know about this "new" product that was now available when we could not afford to take out anything but small ads in the newspaper. The website also gave us the ability to give more information to our customers without them having to have a stranger come into their homes. Over time we began receiving calls and emails from all over the country for requests for us to ship the shelves. We were surprised that people as far away as New York City were ordering shelves to install themselves. We opened our on line store so that these people outside of Arizona could easily purchase our sliding kitchen shelves on a secure web site. We provided our installation and measurement information and soon we were taking orders from all over the country Today there are slews of copycat sliding shelf companies that have sprung up online and across the country. You could say that us putting pull out shelves online let the Genie out of the bottle. We were flattered that these companies liked our idea for slideout shelves so much that they are trying to imitate us. The negative is that many of those companies did not provide a quality product or experience and we hope that does not ever reflect back at us. Some companies sent out the hardware loose instead of installing the slides on the shelves for you like we do. We ship our shelves ready to install with the slides installed and ordered mounting brackets attached to the slides. As is so often true the original is still the best. Our goal is simple, to offer top quality sliding shelves from a quality company that cares about their customers. With over 25 years of experience we know what works and what does not. We also offer other products to help organize your kitchen storage. 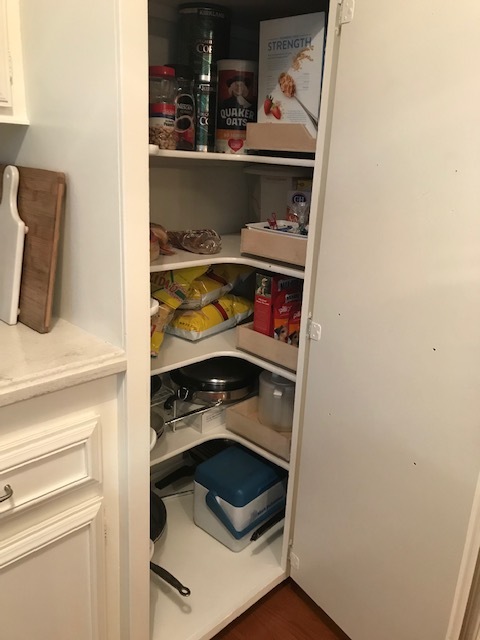 Kitchen storage accessories and we even offer TV swivel and slide out systems and we will continue to add items to our store. Take a look at our television slide out page where we focus on TV sliding shelves and accessories. You will not find kitchen storage, kitchen accessories or kitchen roll out shelves there. We are happy that we can help you save money on the top quality pull outs and kitchen cabinet accessories. Do it yourself with our sliding shelves and kitchen accessories. Factory direct pricing assures you that you are getting top quality pull out shelves and cabinet accessories for prices that beat the cheap shelves that some sliding shelf companies sell. We do not sell our shelves to distributors. We sell you each pull out shelf at a fair price direct from the manufacturer, us. You do the simple installation yourself, avoid the middleman and have top quality sliding shelves as well as money left in your wallet. Pull out shelves from shelves that slide. 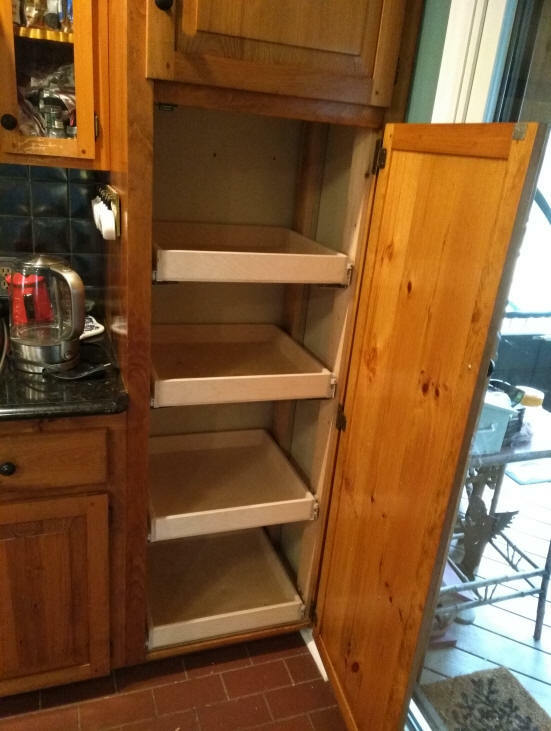 We are not Shelves that Slide LLC, we are incorporated in the sate of Arizona and our corporate name is Shelves That Slide INC.
See what we mean when we say "we make your life easier"
DIY rolling kitchen shelving is custom made to fit your cabinet. Our pullout roll out shelves come fully assembled and ready for installation. We also have a large selection of Rev-A-Shelf Lazy Susans and sliding trash and recycle systems. 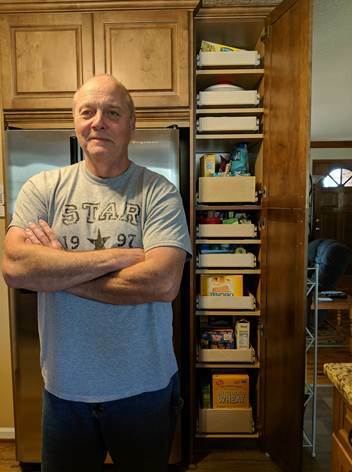 Width 6" to 26" 6" to 39" 6" to 35" 6" to 24"
Depth 10" to 26" 10" to 22" 10" to 22" 10" to 22"
Just wanted to let you know how pleased my husband and I are with the sliding shelves we ordered. We needed 9 of them for a tall, narrow and deep kitchen pantry. We first ordered only 2 so we could check out the quality of construction. They are very well made of excellent quality and reasonably priced. We therefore ordered 7 more. We highly recommend your company for quality, service and affordable cost. Since we aren't professional installers, we decided it would be best to use the base mount method of installation on top of full shelves, as it seemed easier to get accurate measurements on our euro cabinet and side mounting seemed like it would be much more difficult. I included two pics of them with my husband proudly displaying them, since he did most of the installation with minimal assistance from me. One with shelves fully extended open and one with them closed. Thanks again for a great custom made product. I absolutely love being able to reach and organize everything in this cabinet now that I can pull out the shelves. Very Happy!! My husband just installed my new shelves today and I absolutely love them. I couldn't have ordered anything better and the fit is perfect. Thank you for making such a wonderful product. I'm sure you've received many thank you's over the years from happy customers about how their new shelves "changed their lives". Please count this as another! 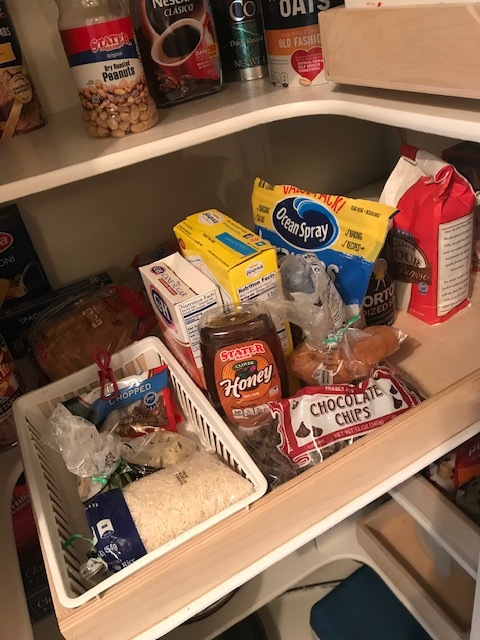 I've attached some photos to show you how our awkward corner pantry has become much more efficient and organized due, in large part, to shelves that slide! Thank you so much. The shelves fit perfectly, were easy to install and I love your instructions, down to earth and in perfect English. Thanks to you.. made in America. I loved the instruction about the "plastic thing" and "now it's time for the screwdriver". That is soooo perfect! Anyway, thanks for doing what you do. can handle a lot of weight. I finally got around to installing your shelves. What a great product! The closet that I was to reno was a little tricky as nothing in this house is completely square. I used the large spacers on the front right side with much longer screws. 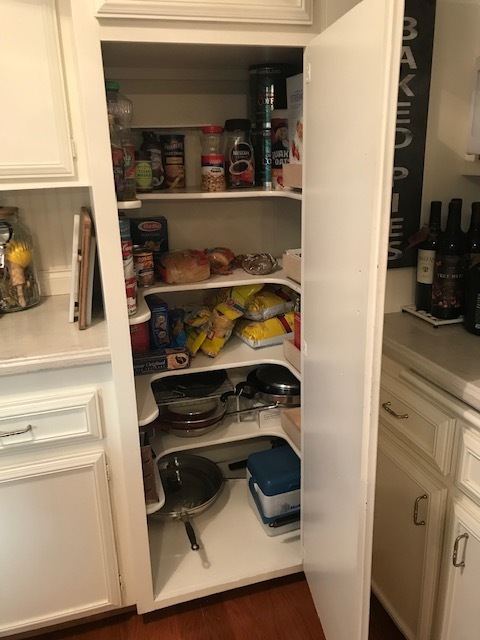 This gave me a slight angle that I needed in order to be able to slide the shelves completely open as the cupboard door backs up to a sliding door, and does not open to a complete 90°. Anyhow, other than a little paint or stain, the job is complete! Attached a few pics. Thanks for your help Steve and I will certainly keep you in mind for any future needs. I’m unbelievably happy with my new shelves! One of the first things I was impressed with was the way the shelves arrived. An elephant would need to step on the packing to cause any damage, every shelf was labeled so we knew actually where each shelf went and the installation instructions were right on. My husband and I always work together of home improvement projects, but unfortunately as soon as the shelves arrived I decided to have a stroke. As a wonderful home coming present my husband had all the shelves installed, lined and everything put away. I could not have asked for a better help in my recovery than my new pullouts from Shelves That Slide. The installation is complete and it went okay. Thanks for all the help. I have one very happy wife with the pull out shelves. Here is a suggestion that I found worked great. When you slide the shelves and need to pull them forward to insert the screws it can be difficult to reach in back. Instead I put wood blocks (need various widths) between the brackets (same for the half shelf) and the cabinet wall. Then I removed the draw and inserted and tightened one screw on each side for left/right movement. If the shelf moved okay I removed it and completed the screws. If it bumped or was too tight I simply adjusted the left/right screw. Saved time and back aches with these 71 year old bones! The shelves I ordered arrived yesterday, and I installed them today without much problem (my measurements didn’t leave much room for error); and they work fine. My wife thinks I am a hero!!!! I want to thank you for building a such a HIGH quality product. I applaud the care you take in prepping the products for shipment so they arrive in perfect condition. I chose the fully extendable draw slides for my project. I ordered a single shelf to make sure I had the dimensions correct and just finished installing 10 of the same size shelves in my new kitchen cabinet cabinets. I chose the slides that anchor on the bottom and it was so simple to install them. I attached the sliding rails to the existing shelves to make the installation easier and so I can move the shelves up or down as needed. The most important thing is that my wife is so pleased to be able to access everything on each shelf since they full extend. Bravo. The new shelves are installed and I am delighted!. Just had two neighbors in this morning to see the finished work and find out how to contact you. I was pleased to give this a great recommendation. I did have the shelves installed by someone else and the ease of getting them in made a believer out of him as well. He noted that he had done lots of work in kitchen including installing other shelf unit and yours were the best made shelves he had ever installed. I want to commend you particularly for the responsiveness of your office staff and Steve. I needed to have the shipping schedule changed because of a trip we had planned. 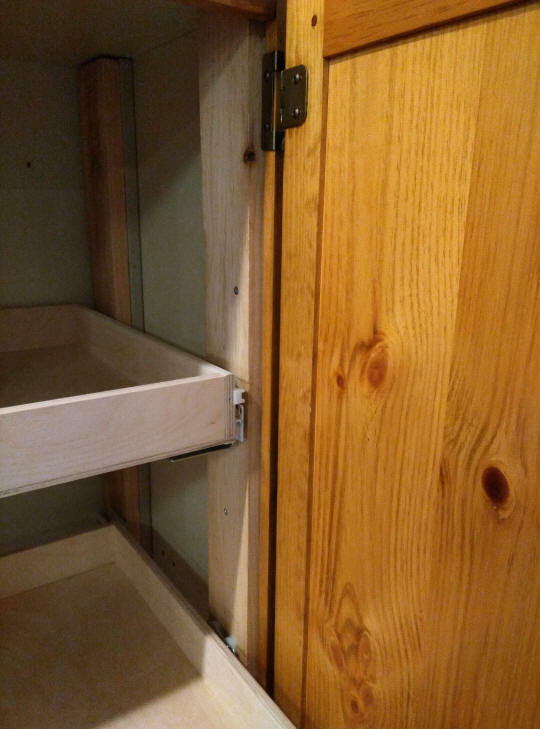 I needed to understand how your shelves would install with the half shelves in my existing cabinets. I really appreciated the pictures answering the installation question and the cooperation in scheduling delivery. Excellent product. Excellent service. Thank you. all of them BY MYSELF! It took me a few hours—but I work rather slowly. Unpacking them took some time due to all the shrink wrap, but they did arrive in good shape so I was glad for that. If your shrink wrap supplier doesn’t give you a huge discount for volume, they certainly should!! The installation was really quite easy to do in spite of the fact that I had removed the little red stop locks on one of the full extension drawers thinking they were part of the packing to keep the drawers from rubbing during shipment. DUH! Once I put them back on the drawer everything worked fine. The quality of the drawers is very nice and they look great! And, more importantly, I don’t have to stand on my head to access what’s in my cabinets anymore! I'm very pleased with the quality. The dimensions were just as ordered. Hopefully the shelf will last a long time. Thanks again. Thanks I was very pleased with last shelves. Much better than Home Depot. I wanted to provide you with another favorable testimonial about your product. The deluxe sliding shelves we purchased were well-built and installed easily. We’re very satisfied with the shelves and have no hesitation about recommending your products to others. Wanted to let you know how pleased I was with your nice product. 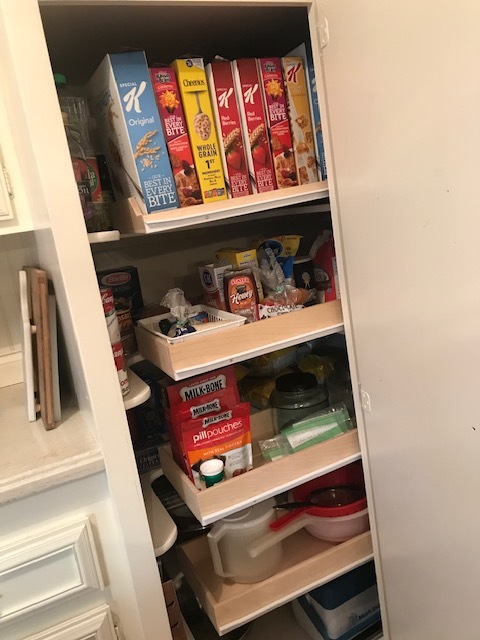 We bought a small beach house that did not have sliding shelves in the new kitchen cabinet like we had in our primary house---fortunately they had come with those cabinets. I found your company on-line. I just ordered 2 shelves at first to try them. I was very pleased and it probably only took me 20-30 min to install the first one, and only 15 min. to install the 2nd one. Your instruction manual was clearly written and was a huge help. You make a great product--and I ordered the other 3 that I need this evening.